Why are we here? What is the meaning of existence? What truly matters the most in life? We have all felt the looming presence of these questions, but it s never easy to examine our life s path and its meaning. To begin finding answers, we must start by exploring our own internal ideals, values, and beliefs. Taking a fresh look at the concept of happiness, James Hollis encourages you to learn to tolerate ambiguity, embrace growth over security, engage spiritual crisis, and acknowledge the shadow of mortality. 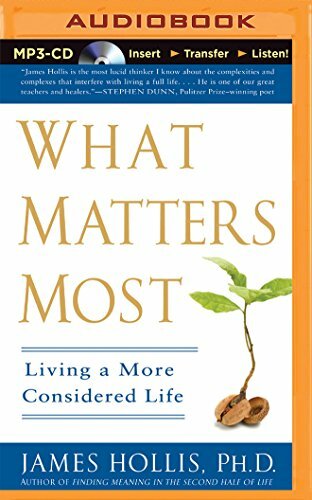 Providing inspiring wisdom and personal reflections to address our deepest worries, What Matters Most will help you get to the heart of the matter, to discover what it means to truly live life to its fullest, most meaningful state as fully engaged citizens of the world and to risk being who you really are." James Hollis, Ph.D., is a Jungian analyst in private practice and executive director of the C.G. Jung Educational Center of Houston. Educated at Manchester College, Drew University, and the Jung Institute in Zurich, he was a humanities professor for more than twenty years and is the author of ten previous books, including the best selling The Middle Passage: From Misery to Meaning at Midlife and The Eden Project: In Search of the Magical Other. Based in Houston, he lectures frequently throughout the country and worldwide.